We’d love your help. Let us know what’s wrong with this preview of The Outlaw's Mail Order Bride by Linda Broday. To ask other readers questions about The Outlaw's Mail Order Bride, please sign up. Talley Shannon’s life has been very har The Outlaw’s Mail Order Bride, by Linda Broday is a 2019 Sourcebooks Casablanca publication. This book was a very welcome change of pace for me and reminded me of how good these western romances can be, and how much I miss reading them. I also loved the colorful and vibrant cover of this book which is in keeping with the sweet romantic dances the main characters enjoyed in the story. The Outlaw's Mail Order Bride was my first time reading Linda Broday and I loved it. Linda Broday has been on my TBR list for a while now and I can't believe I waited so long to read one of her books. This book has some of my favorites in it. You got the mail order bride, the reformed bad boy, cute children, and the villains got their comeuppances! When it comes to historical romance early American Western historical is my favorite. It is also the one genre that is hard to find good authors in. Well I am happy to say I just found another. Linda Broday will be another go to when it come to Western historical romances. Clay was such a good guy. Don't get me wrong he wasn't perfect, but that made him a better hero in my book. Also he had no problem saying sorry. I love when a man can admit to being wrong. I loved how he didn't bat a eye about taking in a little blind girl and making her his daughter. Clay was supportive, sweet, and understanding. He worked so hard to make a good life for his fellow reformed outlaws, his wife, daughter and himself. I totally fell in love with Clay. Tally was equally amazing. I love strong brave heroines and Tally was all that and more. Tally had such spirit. My heart broke for the things she lived through. She had fear and a good reason to be fearful but she fought with everything she had. She also went out of her way to help others. She was the perfect wife for Clay. Clay and Tally's relationship felt strong and real. The reason for this is because the author did a great job of really building up their connection. There was tons of character and relationship development. And not just with the main couple. The secondary characters were amazing too. I became attached to the other ex outlaws, I fell in love with Dr Mary, and I even had a soft spot for Rebel. On top of great character build up there was a great plot too. I loved that I felt like I was transformed back to the wild west. I loved that the bad guys really got what they deserved and I loved that I got so invested in the characters that I can't wait to read each of their HEA. This was a great find and I'm so glad I read it! Another good book of Broday's to escape into. One of the things I love about her writing is how she makes the West come to life. I could really picture in my mind the town Clay and the other outlaws were building. Although I didn't like Tally as much as I have Broday's other heroines, her story was still tragic. This seems to be a prevalent theme in Broday's books and it works well in tandem with the harshness of the West. I liked that female friendship played a small role in her evolution and th Another good book of Broday's to escape into. One of the things I love about her writing is how she makes the West come to life. I could really picture in my mind the town Clay and the other outlaws were building. Although I didn't like Tally as much as I have Broday's other heroines, her story was still tragic. This seems to be a prevalent theme in Broday's books and it works well in tandem with the harshness of the West. I liked that female friendship played a small role in her evolution and the town's. What could have become a catty, angst-filled story-line (a woman, Rebel, from Clay's past reappearing), ended up being a sweet friendship between Tally and Rebel. The Outlaw’s Mail Order Bride is the first book in the outlaw mail order bride series, which is connected to some of Broday’s previous series so it was really fun to see old favorites that connected to this story. This story was a unique twist on mail order brides and I really liked that it wasn’t your average mail order bride romance but with all the aspect of the “wild west” that you can admire and Linda Broday has always done a wonderful job in crafting beautifully penned westerns and this story is no different. The Outlaw’s Mail Order Bride is a stunning romance that sweeps the reader off their feet pretty instantly. What I truly loved about this story was the beautiful love that builds between Clay and Talley. Now at first, I wasn’t quite on board with the heroine, she tended to leave when things get tough, always running but she does learn her lesson pretty quickly. My issue with the heroine is that she tended to break her promises to Clay and take the cowards way out with no protection and anything. But I love that her daughter truly helps her see that Clay can be trusted and that he is strong enough for them both. Even though the girl is terrified of men, she slowly begins to trust Clay and loved their beautiful father-daughter relationship form. Clay is one of the best heroes’ you can read. He is strong, protective, kind and understanding. He never judges either of his girls and just accepts and loves them for who they are and even though he has been burned bad by women in the past he doesn’t let that keep him from true happiness with Talley. 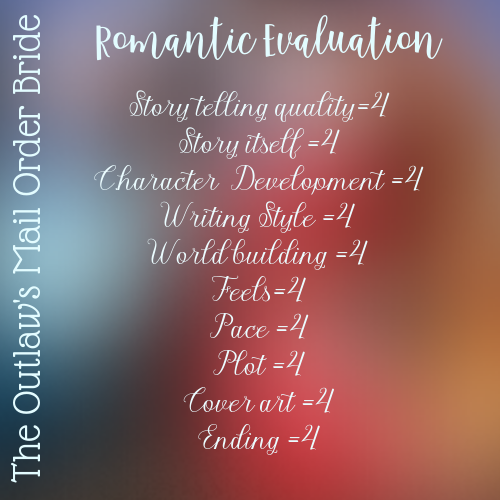 Overall I found Outlaw’s Mail Order Bride to be a stunning story of adventure, edgy suspense, tender moments to delighten you and a romance to cheer on!! "She was tired of settling. She wanted to be all of someone's world, not just a small part. She yearned to fill a man's heart so full that his love for her spilled out all over the place." The Outlaw's Mail Order Bride is about Clay, who I was introduced to in The Heart of a Texas Cowboy. He was a bit mysterious in that book, and that made me curious about him. I am always happy when side-characters get their own story/HEA. And I think he found his perfect match in Tally Shannon, who escaped a psychiatric hospital in which she was wrongfully detained. She is very independent and doesn't trust easily, but she's also very practical. She is strong and can definitely take care of herself. I love these type of women in my Historical Romance books. Clay is a great guy and has turned his life around, he doesn't want to be an outlaw anymore. He was very caring and patient, especially when he first met Tally face to face. He knows he has to be cautious in not making Tally regret agreeing to marrying him. She doesn't come alone. She brings along Violet, a little girl, who is even more afraid of strangers and especially men. Clay has to do his best to win her trust. The scenes between Clay and Violet were my favorites. She was just the cutest. "Sometimes, if we're lucky, there's a crack in the darkness and light seeps in. You're my light, Tally. My hope, my salvation, my future." Sometimes you see the title of a book and you just hafta. Outlaw + Mail Order Bride... yeah, that caught my fancy and I was eager to jump into the next exciting Western Historical romantic adventure by an author who has written some of my favorites in the genre. And, it was a good call. This book gripped me from page one and I was engaged with the characters and their struggles and wanting them to find their happiness nearly more than they did. The Outlaw's Mail Order Bride is the start of a new Sometimes you see the title of a book and you just hafta. Outlaw + Mail Order Bride... yeah, that caught my fancy and I was eager to jump into the next exciting Western Historical romantic adventure by an author who has written some of my favorites in the genre. And, it was a good call. This book gripped me from page one and I was engaged with the characters and their struggles and wanting them to find their happiness nearly more than they did. The Outlaw's Mail Order Bride is the start of a new series. But, surprise! I loved that this series is a spin off from the last book in the Men of Legend series, To Marry a Texas Outlaw, Luke and Josie's story. For those who read that, remember the fugitive women that Luke knew out in that canyon and some of his equally tarnished hero outlaw friends? Yep, we are getting their stories now. The story opens on a dramatic scene when Clay wakes to the day his mail order bride is to arrive and hopes she is the kind of woman who can live simple, work hard, and believe in his dream of starting over. Then an outlaw and his cronies who don't want reform and a new town of hope burn up Clay and the other's hard work and threaten more if he doesn't quit. So, he only has smoldering buildings, a dugout cabin and a tent city to greet Talley. This is it for him and he will give his all to make it happen, but the past just won't let him, it seems. Tally has her own demons to slay and she doesn't have much trust and hope left after the horrendous things that have been done to her, but the sight of Clay's resolve and his gentleness with blind little Violet. She's willing to take just one more chance to find the unconditional love and acceptance with a man and family of her own that she's always wanted even if she has to work hard beside Clay to have it. Things are really hard for both Clay and Tally to get a new start. They are both wanted outlaws and circumstances more than evil intent now have them paying. My heart broke for both of them and all the other men and women outlaws who wanted a second chance and were corresponding back and forth with Luke and Josie acting as the go betweens. Clay and Tally were strong people and there was a spark between them from the beginning. Wariness on both their parts, but longing and vulnerability too. They were amazing together and I loved seeing their frontier life and the town come into shape as their relationship grew as well. One thing I love about this author's historical westerns- okay two things- is the attention to historical details and making sure her stories fit in with the authentic background of the times. I also appreciate that she isn't afraid to make frontier life a little dark and gritty which also lends itself to giving the story a good balance of romance and realism. The bad guys were tough and made the conflict formidable. The tension leading up to the big showdowns kept me flipping pages just as much as the fabulous hard-fought romance. The surrounding cast of characters from both their posse of friends were just as wonderful as the romance pair. This book was the set up for all these others to get their story, too. All in all, I was enthralled and can't wait to get my hands on the next book in the series. Historical western romance fans, we have a winner. Grab it! “You didn’t have to be born to someone to be family. The one you chose is often As Texas as bluebonnets growing on hillsides, cattle grazing lush pastures, or cowboys riding for the brand and longing for a place to belong, Ms. Linda Broday has an extraordinary place in The Lone Star State and the hearts of her fans. The Outlaw's Mail Order Bride once again proves that Linda Broday has a God given talent at writing page turning, edge of your seat, nail biting books. This is certainly such a book. Trying to put this book down at times was like trying to get off of a high speed roller coaster the kind with twist, turns and even loops it's just impossible . Clay, Tally and Little Violet just burrowed up in the corner of my heart. Even cigar smoking Dr Mary and a host of the other characters in this book plucked The Outlaw's Mail Order Bride once again proves that Linda Broday has a God given talent at writing page turning, edge of your seat, nail biting books. This is certainly such a book. Trying to put this book down at times was like trying to get off of a high speed roller coaster the kind with twist, turns and even loops it's just impossible . It was Great to see Luke and Josie from To Marry a Texas Outlaw book 3 of Linda Broday's Men of Legend series make an extensive visit in this book. The Outlaw’s Mail Order Bride by Linda Broday is book one in her Outlaw Mail Order Brides series. This historical western romance is a spinoff of Broday’s Men of Legend series. The author is well-known for her bestselling western romances and this one will undoubtedly be another bestseller. Clay Colby is an outlaw wanted for murder. He’s eagerly awaiting the arrival of his mail order bride, Tally. He’s frustrated and afraid that Tally will walk away when she arrives and sees that the town he bui The Outlaw’s Mail Order Bride by Linda Broday is book one in her Outlaw Mail Order Brides series. This historical western romance is a spinoff of Broday’s Men of Legend series. The author is well-known for her bestselling western romances and this one will undoubtedly be another bestseller. Clay Colby is an outlaw wanted for murder. He’s eagerly awaiting the arrival of his mail order bride, Tally. He’s frustrated and afraid that Tally will walk away when she arrives and sees that the town he built has been burned. Clay’s accustomed to women leaving him and hopes Tally can overlook the condition of her new home. Tally Shannon is also a wanted fugitive with a bounty on her head. She escaped from an insane asylum, where she was wrongfully held. She arrives with an eight-year-old girl she rescued from the asylum and hopes that this won’t be a deal breaker for Clay. The untamed, but beautiful, Texas landscape is a vital part of the story. The harsh environment adds to both life’s hardships and it’s triumphs. The concept of inner beauty over outer, surface, beauty is stressed throughout the novel. An aspect that I appreciated. All the characters are interesting but more background details were needed. This novel is a spinoff of another series and in some instances it reads more like a sequel than a first of series. The Outlaw’s Mail Order Bride works as a standalone, though some details should have been expounded upon. I recommend reading the Men of Legend series before starting this series. I was disappointed with the ending. Actually I was disappointed that the ending was dragged out. The extended scenes disrupted the pace of the novel. The exact same resolution could have been reached with a lot fewer words. Overall, I enjoyed this book and rate it 4 out of 5 stars. I recommend The Outlaw’s Mail Order Bride to readers of historical romance, especially those who enjoy western romance. Be aware: this is not a chaste romance. The book also has some depictions of physical and sexual abuse that may be disturbing to some readers. My thanks to SOURCEBOOKS Casablanca and NetGalley for the opportunity to read an advance copy of this book. However, the opinions expressed in this review are 100% mine and mine alone. Clay Colby is a man with a past. Tally Shannon is a woman with a past. Clay Colby, once an outlaw, is looking to start something great. He has a big dream of building a town and wants to start sharing his life with someone. Tally Shannon, once a wrongfully accused patient in a psychiatric hospital is on the run from the ones who kept her imprisoned in the hospital. Tally only wants someone to protect her and her daughter and keep them safe. Can Clay do that? I found Clay and Tally’s love story e Clay Colby is a man with a past. Tally Shannon is a woman with a past. I found Clay and Tally’s love story empowering, enlightening, and full of hopes and dreams that are not too hard to reach, if they can get past the problems that they face. Clay and Tally show a love for one another and others that is transcending. I thoroughly enjoyed this story. Clay, Tally, little Miss Violet and Bullet (the dog) will wind their way into your heart and mind. Linda Broday, as always, captivates readers by painting a scene of the Texas frontier. She never fails to make you feel as though you are there with the characters. Seeing the same things, smelling the same smells, hearing the same sounds. She truly brings you into her books. The Outlaw’s Mail Order Bride will be on my shelf of favorites to come back to time and again! This is the first book in a brand-new series by Ms. Linda Broday. It might be the first, but I hope not the last. This book by Linda Broday is a true love story. It is about the purest kind of love that lucky people get to experience. It proves that love rises above physical beauty, past experiences, and forgiveness. Clay and Tally start out as a marriage between a guy who is also an outlaw and a woman that has had some of the worst experiences we could ever dream of. It also gives you a glimpse This is the first book in a brand-new series by Ms. Linda Broday. It might be the first, but I hope not the last. This book by Linda Broday is a true love story. It is about the purest kind of love that lucky people get to experience. It proves that love rises above physical beauty, past experiences, and forgiveness. Clay and Tally start out as a marriage between a guy who is also an outlaw and a woman that has had some of the worst experiences we could ever dream of. It also gives you a glimpse into asylums as they were in the olden days. In fact, it is only in the last 50 years or so that they have become places of actual treatment. Clay and Tally go through the ups and downs of marriage trying to learn when to lead and when to follow. Most especially, they have to learn to trust. Some things to think about as you read this book or hopefully to entice you to read this book. Have you been privileged to experience true love that will last forever? Have you been one to look beneath the surface of the one you love and see what is really there? Have you had to be the strength for your man at times, but other times he has had to be yours? Is marriage controlled by one person or is it a give and take between two people who live as one? Find out how Clay and Tally answered these questions in this book. This is one of the best books I have ever read by Linda Broday. It is the truest and purest love story I have read in a long time. If love is your interest, do not miss this book. I could not put it down it was so compelling. Thank you, Linda Broday, for this book and all the ones you have written. But, so far, this is one of if not the best book you have published. The Outlaw’s Mail Order Bride by Linda Broday is the 1st book in her new western Outlaw Mail Order Brides series. I have enjoyed Broday’s previous books book in a couple of her other series, and I am happy to say this was a wonderful start to another good series. We meet our hero, Clay Colby, who is in the process with some of his outlaw friends, trying to rebuild a town (Devil’s Crossing) for them to start a new clean life. Clay is waiting for the wagon train to arrive bringing him his mail orde The Outlaw’s Mail Order Bride by Linda Broday is the 1st book in her new western Outlaw Mail Order Brides series. I have enjoyed Broday’s previous books book in a couple of her other series, and I am happy to say this was a wonderful start to another good series. We meet our hero, Clay Colby, who is in the process with some of his outlaw friends, trying to rebuild a town (Devil’s Crossing) for them to start a new clean life. Clay is waiting for the wagon train to arrive bringing him his mail order bride. When Clay meets his bride to be, he is shocked to see a young girl with her. Talley Shannon is determined to protect herself, as well as the young blind girl under her care. Tally is on the run from some bad guys, and marrying Clay will help her begin a new life. Tally’s history is sad, as she escaped a terrible psychiatric hospital that she was falsely admitted by her greedy evil stepmother, after her father died. Both she and the little girl, Violet were abused and tortured, but Tally is a strong and forceful woman. Tally explains that if he wants to marry her, he will have to accept Violet too. What follows is both an exciting story line, and a sweet romance between two people with flawed pasts that will catch up with them. Tally has problems with trust, especially with always being on the look out of the evil men still stalking her. In time she realizes that Clay is a good man, who will do anything to protect her, and Violet, whom he begins to treat like his own daughter. Though early on, Tally tries to run in fear of those following her, but Clay will prove to her that he is in this for the long run, and promises to protect her. Slowly more people come to join their town, and help with the rebuilding process. They all stick together to protect Tally and Violet. There were some great secondary characters they we got to meet, and learn to care for, such as the Januarys, Dr Mary, Rebel, and it was great to see Luke and Josie from Broday”s previous series. What I loved the most was watching Tally fight her trust issues, and allow herself to fall in love with Clay. Violet, though struggling with her blindness, was a treasure, who became more self sufficient with the those in town who loved her. Clay’s dog Bullet was a perfect companion for Violet, and protective of them all. The last half of the book was very exciting, as a few times they find themselves in dangerous situations, which will bring them face to face with the three evil men following Tally. Another group of women who escaped the asylum were rescued by Clay and Tally, bringing some to their town. When they stave off the bad men, and the nasty stepmother, they head home with good news. Tally is free, and Clay receives amnesty, and a happy time for all. But just when things begin to look good, a shocking surprise will come back to rear its ugly head, causing intense action and threats to their survival, with both Rebel and Bullet seriously injured. 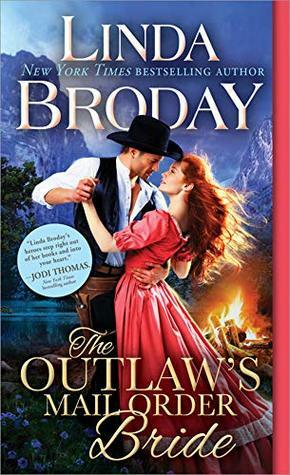 Linda Broday has once again given us another wonderful new western historical series, with a fantastic group of characters, and a couple we fell in love with. The Outlaw Mail Order Bride was an emotional, exciting, romantic story that played often with our emotions. In the past I always felt "meh" about reading western historical romances. They were okay, but didn't thrill me. I do believe the talented Linda Broday has changed my position on this genre! This book had non-stop action, suspense, drama and steamy loving. I must read more of her stories, and I eagerly await the next book in this exciting new series. This series is apparently a spin off of a previous one. Don't worry; this one totally stands alone. 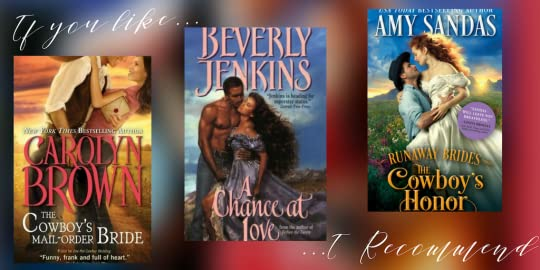 (Warning: You WILL want to go back and read the In the past I always felt "meh" about reading western historical romances. They were okay, but didn't thrill me. I do believe the talented Linda Broday has changed my position on this genre! This book had non-stop action, suspense, drama and steamy loving. I must read more of her stories, and I eagerly await the next book in this exciting new series. This series is apparently a spin off of a previous one. Don't worry; this one totally stands alone. (Warning: You WILL want to go back and read the previous series. I was excited to find I actually own those books already. Yay me!) Clay Colby was an outlaw, but he decided to go straight and build a town that would be a haven for other folks like him. He was lonely and wanted to wed. Enter Tally Shannon, who agreed to be his mail order bride. She arrives, carrying a lot of attitude and mental baggage. Oh, and a little blind girl. Clay was not expecting that! At first I was not horribly fond of Tally. She was hard to like. Considering she had escaped from a mental institution where she had been horribly brutalized, one could understand her issues. Clay was likeable right from the start. He worked hard to win her over, as well as Violet, the little blind girl. Even though Tally tried to resist him, the chemistry was there. As their relationship grew, my liking for Tally grew. But as often happens with outlaws (and mental institution escapees, of course), the past catches up with them. Clay and Tally were fantastic leads. However, the supporting cast was just as wonderful. Especially compelling were Violet, Bullet the dog, Rebel (a woman from Clay's past), Dr. Mary and Montana Black (who at the beginning burned down the town Clay and his friends were building). I particularly liked Jack, a fellow outlaw. I want more of him. I challenge you to read this book without tearing up; bet you can't do it. You will cheer for this entire town of outcasts and misfits. I received an ARC of this book courtesy of NetGalley and Sourcebooks Casablanca. I received no compensation for my review, and all thoughts and opinions are entirely my own. The book starts at Tally and Clay’s first meeting. Tally has recently escaped from an Let me correct any misconceptions you may have from the cover of this book. THE OUTLAW’S MAIL ORDER BRIDE is not a sweet or gentle romance novel. The story is gritty, it’s real, and it’s as tough as its characters. If you are bothered or triggered by difficult subjects, this is not the book for you. What Tally endured in the asylum is horrific and hard to read at times, but made for a gripping and engaging read. Outlaws, asylum escapees, and saloon floozies...oh, my! As in, oh my, what an unbelievably enthralling story by the incomparable Linda Broday. This is the first book in her Outlaw Mail Order Brides series, and I can hardly wait for the next one. Clay Colby is searching for a new path in life, one which leaves his outlaw past behind him. He and many of his friends, most of whom are also former outlaws, are intending to build a new town where they can be free to live ordinary lives. The loneliness has driven Clay to seek a mail order bride. He hopes this third attempt will be the lucky one, as the previous two potential brides changed their minds after seeing the primitive condition of the town, Devil’s Crossing. If Tally refuses to stay, Clay has decided he will give up the attempt and live alone for the remainder of his life. Tally Shannon has been brutally torn from her life by her evil stepmother, who not only murdered Tally’s father, but then had Tally institutionalized in the horrendous Creedmore Asylum. In her year of captivity, Tally was hurt, used, and degraded by the depraved men running the asylum. She manages to escape, and establishes a rescue team to remove other innocent prisoners from the asylum as she is able. When an opportunity arises to become a mail order bride, Tally accepts, and heads to Devil’s Crossing to meet her intended. Clay does have a criminal past and has done some awful things. His desire now is to live in peace, and have a home, a wife, and family. Though suffering many losses, Clay is kind, soft hearted, considerate, hard working, and a genuine romantic. I loved his vulnerability and sensitivity, which he managed to retain, even after living an outlaw’s life. He is smitten by Tally when he sees her, and his decision to love and protect her is hero-worthy. Tally has learned to be tough. Though she’s willing to give her marriage a chance, she still holds a part of herself back, not willing to fully trust a man or to give up control of her life. She blatantly tells Clay that if things don’t work out between them, she will be leaving him in the spring. Both Tally and Clay have suffered much, and made many mistakes. While they have a strong attraction to each other, there are many external events and people that won’t allow their marriage to flow along an easy path. They have to deal with the vengeful asylum owner who’s determined to have Tally back, a woman from Clay’s past who wants him back, outside outlaws who won’t let them live in peace, and Clay’s own criminal past means there’s still a bounty on him. THE OUTLAW’S MAIL ORDER BRIDE is a realistic look at the hardships of life in 1879 Texas, as well as a tender and satisfying love story that is guaranteed to please fans of western romance. Wow, wow, is how I start my review. I knew this was going to be a good book, and Linda Broday didn't disappoint me one bit. I pretty much read until I was done with the whole book. I didn't want to put it down. Clay and Tally, both have things in their past that effect how they act in the present. Both have to each come to terms with the other's strength and weaknesses. Linda Broday takes you on a journey that will have you laughing, crying, angry, hope, and hopelessness all come to play in this Wow, wow, is how I start my review. I knew this was going to be a good book, and Linda Broday didn't disappoint me one bit. I pretty much read until I was done with the whole book. I didn't want to put it down. Clay and Tally, both have things in their past that effect how they act in the present. Both have to each come to terms with the other's strength and weaknesses. Linda Broday takes you on a journey that will have you laughing, crying, angry, hope, and hopelessness all come to play in this book. Trust doesn't come easy for either of them. Tally comes with a past and with little Violet. Violet is blind, and doesn't trust anyone but a couple people. The twists and turns concerning Violet, made me feel so many emotions, and I was left wondering if like Marley, will Violet get her story told when she grows up? Watching her learn to trust and love is wonderful. And the people she trusts the most surprises everyone around her. This is a town, set in an area where outlaws could come and chill while on the run. It is a place that a group of former outlaws want to stay and call home forever. As the town is being built, we are able to visit with old friends, and make some new friends. As vistors come and stay, we slowly learn more about why they are there. What talents they have to make life better for everyone around them. Clay and Tally's story delivers an emotional, heart-rocking, and hard-won happily-ever-after! From the first chapters, my heart twisted both good and bad with all their emotions!! So much pain and confusion accompanied by longing and desire from both of them just trying to figure out who they were, what they needed and wanted, how to get it, and how to let go. You experience Tally's intense struggle with figuring out how to trust Clay, a stranger who is now her husband. You can't help but be char Clay and Tally's story delivers an emotional, heart-rocking, and hard-won happily-ever-after! From the first chapters, my heart twisted both good and bad with all their emotions!! So much pain and confusion accompanied by longing and desire from both of them just trying to figure out who they were, what they needed and wanted, how to get it, and how to let go. You experience Tally's intense struggle with figuring out how to trust Clay, a stranger who is now her husband. You can't help but be charmed by Clay's natural instincts to protect and provide for his new wife and daughter. My heart rejoiced with them as they finally were able to find and nurture a fragile trust-filled bond between them. Watching their connection continue to strengthen swept my heart into pitter-patters! Throw in a delightful little girl in Violet (seriously, you gotta love that little girl! ), a beautifully loyal fur-baby in Bullet, and some beloved (cross over) characters, and you get some heartwarming smiles! I loved the lessons taught in digging deeper beyond the surface of what you think you know in a person. Don't be so quick to judge or believe that there isn't some hidden story that can change how you perceive a person. You may be surprised to discover who all that statement applies to (including real life - not just in this book fiction-wise). Clay was one for me, because I think you first see him as a more gentle kinda guy and may wonder about the outlaw rough-and-tumble side of him—but hang on because when the poop hits the fan...... Clay is definitely someone you want at your back! THE OUTLAW’S MAIL ORDER BRIDE is the first title in Linda Broday’s series, Outlaw Mail Order Brides and it packs a seriously powerful punch of a kick-off story to begin a new adventure. I was easily caught up in the world building for this series as Clay and his friends (former outlaws) set out to change a dying town into a new viable place for them all to build new lives and find happiness. We’ll meet several intriguing, fun and downright cute secondary characters that I’m anxious to learn more about as this trilogy continues. Tally is an amazing character. You cannot help but feel outraged on her behalf for the wrongs that have been done to her by so many truly evil people. She has trust issues, which makes perfect sense knowing her background, but she’s learning that Clay will stand beside her, protecting not only her but a sweet, innocent young girl who has also been dealt a horrible blow by those people that Tally escaped from. Watching these three form a family was a loving, enjoyable journey. I found THE OUTLAW’S MAIL ORDER BRIDE to be packed full of action, danger, good people turning their lives around, the chance to find love for themselves at last, some truly evil people who deserve every last thing that is dealt to them… and a whole new town that I cannot wait to learn more about over time. I enjoyed every moment spent in this world, and if you love Western Historical Romance then this is a story you’ll want to grab for yourself. I’d not hesitate to recommend this story to any reader who enjoys a good, solid plot, interesting characters, a couple to fall in love with, watching the bad guys get what they deserve and a happy ending for Tally, Clay, and Violet. Be still my heart! I have fallen in love with western historical romance and just cannot read enough! Linda Broday is a master at developing a sense of time and space where you almost feel you are there and with her in depth character thoughts and descriptions, they come alive off the page. Once I started, I could not stop, so set aside some time when you begin because it will pull you in quickly! Clay and Tally both have pasts they want to forget and begin life anew as husband and wife. Clay was Be still my heart! I have fallen in love with western historical romance and just cannot read enough! Linda Broday is a master at developing a sense of time and space where you almost feel you are there and with her in depth character thoughts and descriptions, they come alive off the page. Once I started, I could not stop, so set aside some time when you begin because it will pull you in quickly! Clay and Tally both have pasts they want to forget and begin life anew as husband and wife. Clay was a previous outlaw that has tried to build a town but it seems he cannot catch a break. As his mail order bride arrives, he knows she might turn around and leave when she sees how the town has been burned. Tally has escaped from an insane asylum, where she was wrongly held and brings with her a little girl Violet that escaped with her. These two just warmed my heart and pulled me into their emotions. Tally just wanted someone to protect her and Clay was up to the challenge. Love, love this book! I couldnt put it down. Interesting from start to finish. You will love Clay a man with a past and Tally a woman with a past. Very emotional and heart warming. 5 STARS!! The Outlaw's Mail Order Bride is the first book in Linda Broday’s new series Outlaw mail order brides. Talley Shannon is no ordinary woman. Having escaped a psychiatric hospital is searching for a protecto The Outlaw's Mail Order Bride is the first book in Linda Broday’s new series Outlaw mail order brides. Clay Colby’s an outlaw trying to go straight. Working with other men to build a new town called Devil’s Crossing, he longs for a partner in life. His friend Luke runs a rather unusual mail-order bride service, finding brides for men who can’t advertise through normal channels, and through Luke Clay finds Tally. Betrayed by her stepmother, she was placed in a lunatic asylum and horribly maltreated before being able to escape, taking with her several other women and Violet, a blind little girl unw Clay Colby’s an outlaw trying to go straight. Working with other men to build a new town called Devil’s Crossing, he longs for a partner in life. His friend Luke runs a rather unusual mail-order bride service, finding brides for men who can’t advertise through normal channels, and through Luke Clay finds Tally. Betrayed by her stepmother, she was placed in a lunatic asylum and horribly maltreated before being able to escape, taking with her several other women and Violet, a blind little girl unwanted by her parents. Tally’s and Violet’s stories would tug at the hardest heartstrings, and Clay’s an absolute sucker. He’s also a good, patient man willing to wait for both to trust him, demonstrating in every way possible that they can do so. His romance with Tally and his care and love for Violet was both heart-warming and very believable, as well as his outrage on their behalf and determination to see justice done. However, this is where things got a bit messy. There were an incredible amount of secondary characters in the book, so many I lost track of who was who after a while. I understand this is the first of a new series, and I think Broday may have succumbed to the temptation to introduce too many characters who will appear in later books. There was also a section where I thought the story was about to wrap up, about 85% of the way through the book, because things seemed to be about over. I assumed the rest of the book would be a preview for the next story, but no. Instead, Clay went off on a solo adventure for several chapters, introducing MORE new characters, and doing a lot of unnecessary faffing about, in my opinion. The whole section could have been erased by jumping straight to the courthouse and having him arrive with his prisoner just in time. It was unnecessary, pulled me out of the story by separating for a long section a couple I wanted to see together, and felt like unnecessary filler to make up a required word count. While there were parts of the story I enjoyed, there were too many characters, too many subplots and also some really dark and brutal stuff a lot of people could find triggering, for sexual, physical and emotional abuse, torture and even child abuse. It was all a bit too much for a romance and at the end of the day, I wouldn’t read any more in this series or even recommend it to lovers of Western historical romance. Two stars. I really enjoyed Clay and Talley's story. After meeting Talley in the Men of Legend series, I was happy to see her get her HEA! Clay and Tally have been writing to each other and it is finally time for them to meet. Unfortunately, the town that Clay had hoped to bring Tally to has been practically burned to the ground. Clay doesn't think Tally will stay when she sees the place. Tally is tougher than Clay realizes and agrees to stay and get married. Although both have issues stemming from their pas I really enjoyed Clay and Talley's story. After meeting Talley in the Men of Legend series, I was happy to see her get her HEA! Tally is tougher than Clay realizes and agrees to stay and get married. Although both have issues stemming from their past, they get along well together. But when Talley's past comes to haunt her, things may change. Can this relationship withstand the trouble to comes? Clay and Tally were perfect for each other. He was so protective of her and Violet. Tally just needed to learn that there were people out in the world that she could trust with her life. Another good read by Linda Broday. This is a series taking off from previous series Men of Legend. Which when reading that series you do want to know what happens to others at the end of a book. It is nice to see what happens in Clay Colby life. There was too much going on with sub plots. I was interested but, too much. I did like this book and will definitely read the next book coming out soon. In romance novels, my favorite sub-genre is mail order brides. I was surprised with the outlaw twist and the interesting information about the genesis of a town. The all story was quite interesting, however I did found some inconsistencies in the plot. Still, its a great title and I really want to read the rest of the Outlaw Mail Order Brides series. I received a copy of this story through NetGalley for my honest opinion. In romance novels, my favorite sub-genre is mail order brides. I was surprised with the outlaw twist and the interesting information about the genesis of a town. The all story was quite interesting, however I did found some inconsistencies in the plot. Still, it´s a great title and I really want to read the rest of the Outlaw Mail Order Brides series. Cowboy romances normally aren't at the top of my list of books to read but something about this blurb caught my eye so I decided to give it a try. I am glad I took a chance on it because I ended up really enjoying it and read it in 2 reading sessions. I absolutely loved Clay's character. He won my heart over from the moment he picked flowers to try and make his home more welcoming for Tally. Then we see his patience and love for a little girl, Violet, and OMG, just take my heart right now! I lik Cowboy romances normally aren't at the top of my list of books to read but something about this blurb caught my eye so I decided to give it a try. I am glad I took a chance on it because I ended up really enjoying it and read it in 2 reading sessions. Women abandoned to die and men running from the law, is there a way to find peace and happiness? Even outlaws want love and a family. Women escaped from a hell want to be wanted and loved. Clay and Tally work on making a new family with Violet. But, old torments and tormentors have to be dealt with. Others need to be set free. Can justice be served? Will there be hope? How much does happiness have to cost? This engaging story plays out vividly as the characters are so robust and alive. The reader Women abandoned to die and men running from the law, is there a way to find peace and happiness?